Resolutions are made leading up to every January 1st, but unfortunately, 80% of New Year’s resolutions fail by February. If your goal involved becoming a healthier you, maybe you joined a gym, or started a calorie deficient diet, or even opted for a “Dry January.” Honestly, you should be commended for your effort. The decision to improve your health is a good one. The problem is that health is complex and requires a plan with a great deal of patience and persistence to achieve. From personal experience I remember the moments when I would walk into the gym and feel overwhelmed by the numerous choices of what could be done for the workout. Usually, I would simply step onto the treadmill or elliptical and try to sweat for awhile before hopping off without second-guessing my choice to workout that way. Surely, this is not bad. On the contrary those minutes were helpful for my heart health and kept my caloric burn above zero. However, I now see those moments were wasted opportunities that could have been remedied with a clear goal in mind. The key to success is setting the right kind of goals and developing a plan to achieve them. Your plan needs enough detail to drive successful completion with enough freedom to modify when changes need to be made. The right plan of action involves a team to hold you accountable to ensure that you don’t drop your resolution by February. When I take on a client in personal training I help that person come up with clearly defined goals, so that we can mutually work to develop a plan for success. The plan should be focused beyond the most common goal of losing “x” amount of pounds. When considering human motivation we know that pain can be a uniquely powerful tool to help us perform a behavior in hopes of feeling less pain. Sales people and marketers use these tools to encourage buyers to choose their product, whether or not they truly need or want it. Salespeople have the skill of displaying their product in a way that gives soothing relief to one of our pain points. We can use this technique in ourselves to help instigate lasting change. So, is the point of losing weight just a matter of having less mass on the scale or is it more psychologically complex? Thus, your goals need to go beyond a number. The goal needs to correspond to something that really matters to you. What hurts you so much right now that you can’t do, but you would do anything to be able to? Personal training should also focus on more factors of your health beyond your weight or body mass index. Training should focus on other health variables. For example, at the end of 2017 I had a client come to me for training who had an A1C, a measure of blood sugar levels, of 12.0, which would put her in the range of being very dangerous blood sugar and potentially deadly. By setting goals, increasing physical activity, and being held accountable, she lowered her A1C to a much healthier 6.5. That type of change is not one that will show up on the scale, but it is the kind of change that will keep you alive and functioning. A lifestyle change is not a single moment in time, it is every moment in time. Patience and persistence is truly the key. The goal of all fitness intervention by a professional should be to educate, guide, and prepare someone to manage their own health. 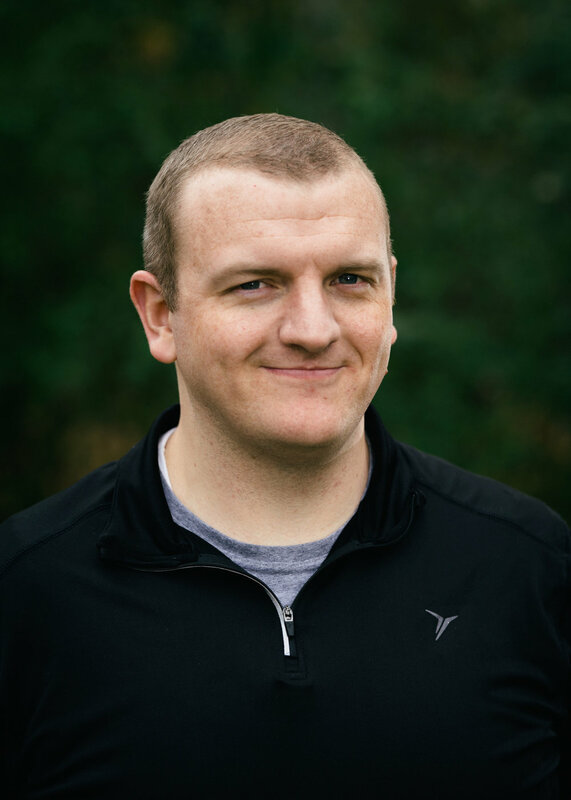 If you would like to schedule a consultation to talk about what we offer for personal fitness training, please reach out via email dan@AGADAPT.com or phone (952)303-4550. Payless recently conducted a very telling social experiment. You probably heard about the shoe chain’s stunt in the news but just to recap quickly, “The Payless Experiment” tricked consumers into buying their typically budget-friendly shoes at sky-high markups. To carry out the clever ruse, the discount retailer invited style influencers to a (fake) launch party for a new high-end label in one of Los Angeles’ glitziest shopping areas. The attendees believed that they were buying fashionable, high-quality footwear and therefore didn’t object to the three-figure price tags. Aside from being a brilliant marketing ploy for Payless, what lessons does “The Payless Experiment” have for our current healthcare system, and specifically for patients suffering from low back pain? The experiment is a commentary on perceived vs. real value but also how easily people can be swayed into believing that something is reliable as presented. Think about someone who has had weeks of pain and dysfunction stemming from low back pain: she wants to find a solution that will relieve her symptoms. If a physician presents surgery as the best option—and she’s assured that her pain will go away—then it’s going to sound appealing, right? Today’s consumer has so many choices when shopping for just about anything from apparel to healthcare. But while it’s customary to shop for the best price for a goose down jacket (without sacrificing quality), shopping around for the best solution (and value) for our ailments is less typical. Doing our due diligence in healthcare may ultimately bring us back to the first proposed solution, but it also may introduce us to solutions that we didn’t know existed. In the case of low back pain, one such under-heralded solution is physical therapy. Physical therapy, yoga and acupuncture are gaining in popularity as equally (or more) effective and less costly than surgical procedures, injections, MRIs and pain relievers—and for good reason. Physical therapists are trained to restore and improve patients’ mobility, reduce soft tissue pain, improve function and build muscle strength. They not only develop custom strategies to treat persistent or recurrent low back pain, but educate patients on the prevention of future issues. Some preventive techniques include adopting and following a regular exercise program and learning to lift correctly by keeping the object close to the body. As the holidays kick into high gear, you likely have a long list of gifts to buy. I’m willing to guess that you have a strategy in place for selecting appropriate gifts for each recipient. As you match the right price point, size and color to each person on your list this holiday season, think about approaching your healthcare needs with the same level of scrutiny. After all, finding the right solution at the right price for our health needs contributes to improved long-term outcomes and better piece of mind. When it comes to children and adolescents participating in resistance training there are a lot of falsehoods, myths, and opinions that are not supported by any evidence. Most individuals believe that without a doubt strength training is not for children. This is unfortunate because we now know that children and adolescents can significantly benefit from participating in resistance training programs. Won’t It Stunt The Child’s Growth? It was once thought that resistance training would potentially stunt growth. The myth was that children performing resistance training would injure the growth plates in their bones, and thus it would literally stunt a child’s growth. No research has ever shown that resistance training will injure a child’s growth plates or limit their growth potential. Unfortunately, these prevailing beliefs act as a thought virus, and have held children and adolescents back from participating in resistance training. The fact of the matter is that alternatively to resistance training being bad for you, we can actually see that participating in resistance training may actually be helpful by improving bone growth. The implications are huge because a disease such as osteoporosis (bone wasting) is a childhood problem with adulthood implications. Meaning that we need to have children doing higher load physical activities in order to reduce the likelihood of having osteoporosis in adulthood. Strength training in youth and children can actually help to reduce the likelihood of injuries in sports. A program of resistance training can help children and adolescents increase their power, coordination, improve their change in direction speed and improve their motor control. When children participate in sports and initiate a resistance training program in the preseason there is a reduction in the likelihood of them getting injured during the season. Some of the most complex injuries such as anterior cruciate ligament (ACL) tears can be prevented by strength training. Around the world obesity is becoming an epidemic for children and youth. Aerobic exercise and resistance training have both shown to be effective at improving body composition, improving cardiovascular health and reducing body fat. Children should be getting 60 minutes of exercises 7 days a week, and within that amount of exercise adding resistance training exercises 3 days a week should be sufficient. When a child is beginning a resistance training program they should be monitored closely. Resistance should be added slowly to ensure that proper lifting mechanics and form are maintained throughout the training program. It is recommended that a skilled professional help the child to design a resistance training program that is ideal for them. Depending on the capacity of the child or adolescent resistance training can begin with body weight and then progress to include free weights, machines and resistance bands all under the direction of a skilled professional. For all children and youth it is recommended to make physical activity enjoyable. The benefits of resistance training are short-term unless the behavior is continued. Children should find exercises that are fun for them. For younger children this may involve making training into a game such as tug of war, or climbing around a playground. As children age they may enjoy doing push-ups, pull-ups, sit-ups, bear crawls, or wheelbarrow walking. Exercise that is fun and enjoyable can make a big difference in helping to make it sustainable. In conclusion coaches, parents and guardians should not discourage children and youth from participating in resistance training programs. On the contrary we should facilitate children in performing more physical activity including resistance training to improve their health, reduce their likelihood of injury and to promote their psychological well being. If your child needs help to initiate a program or has suffered an injury please call for a free consultation. Lloyd, R. S., Faigenbaum, A. D., Stone, M. H., Oliver, J. L., Jeffreys, I., Moody, J. A., ... & Herrington, L. (2014). Position statement on youth resistance training: the 2014 International Consensus. Br J Sports Med, 48(7), 498-505. When it comes to musculoskeletal (think back, neck, shoulder, hip, knee etc.) pain there are just about as many treatment options as there are colors in the rainbow. That can be a good thing as it allows people to seek out potentially helpful options. However, in a country where hundreds of billions of dollars are spent each year on managing these conditions it is important to have some current facts to support how we manage musculoskeletal pain. That is why we look to the research. In 2017 a research article was published that summarized 146 other research studies on the best treatments for musculoskeletal pain. The article gave us insight into what areas we can focus on to help people feel better when they are hurt. This was a valuable paper because it got to the heart of a complex problem and was supported by solid evidence, not the most recent fad treatment option that are shared by friends on Facebook or that you find on Buzzfeed. The pyramid below is a basic representation of what actually works based on current research. The research article found that for musculoskeletal pain, exercise was the best treatment option available. The amazing thing about exercise as a treatment is that when someone is compliant with the exercise it has lasting effects. The trouble with more passive modalities such as acupuncture, TENS, ultrasound or manual therapy (hands on) techniques, is that when we follow individuals long-term the benefits decrease unless they are combined with exercise based interventions. It is amazing! A relatively low-cost treatment has a powerful effect to change pain for the long-term. I do think that it is important to mention how important psychological treatments such as cognitive behavioral therapy and instruction on coping behaviors can be. It is important to always remember that none of us are just a bag of muscles and bones. We all have thoughts, emotions, feeling and perceptions, and all of those things can influence the pain that we feel. Because of that, it is important to dedicate time to making sure that our thoughts, emotions, feelings and perceptions are not interfering with our health and healing. So, next time your back pain flares up, or you try to throw someone out in your rec league softball and hurt your shoulder, consider trying conservative care before seeking out more involved treatment options. 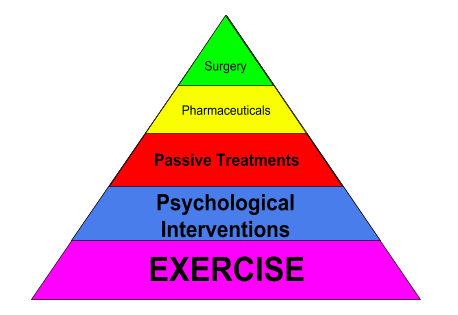 A physical therapist can be a great starting point that can help you determine whether or not you would benefit from conservative management with exercise or if you need to move further up the pyramid. Babatunde, O. O., Jordan, J. L., Van der Windt, D. A., Hill, J. C., Foster, N. E., & Protheroe, J. (2017). Effective treatment options for musculoskeletal pain in primary care: A systematic overview of current evidence. PloS one, 12(6), e0178621. Are You Still Doing Static Stretching As Your Warm-Up? Almost without fail when you show up to an athletic event of any variety, (team sports, races, etc.) you will see someone with their knees completely straight trying their absolute hardest to reach their toes. They are most likely cringing as the pull on what are really tight hamstring muscles. A nice hamstring stretch may not be a bad thing every now and then, especially if your goal is to reach your toes with less feeling of pull in the hamstring. However, the warm-up before an athletic event is what can get you in “the zone” where you are ready to perform at your maximum. The 15-30 minutes you spend in preparation can be the difference maker in the outcome of your event. A well thought out and designed warm-up can help set the tone for a great practice or performance. What we are seeing from more current research is that static hold stretching, usually done for anywhere from 15 to 90 seconds, is not actually effective at reducing injuries, and may in fact limit your performance. It is true that static stretching will help to improve your range of motion, however, we can see similar improvements in joint range of motion with more active mobility drills as well. What should you be doing for your warm-up before getting into your preferred sport? In general, warm-up programming has focused around a principle called RAMP (Raise, Activate, Mobilize, and Potentiate). Basically, you are looking at breaking down your warm-up into 4 phases. Think rotator cuff, glutes, hamstring and quads, abdominals/core, etc. The RAMP system of a warm-up is much more of an active warm-up than a general static stretching protocol. It involves getting the body ready for the task at hand. All of that said, it is not wrong to add static stretching into your your regimen especially if that has been your mode of getting your mind mentally prepared for your event. However, that stretching would best be added to the beginning of the warm-up, to avoid potential detrimental effects of static stretching on performance. The beauty in all of this is that where research was not finding benefits in stretching, and may have actually been doing some harm on performance, dynamic warm-ups (RAMP) with a neuromuscular training component have been shown to help reduce injuries, at least in team sports. The most heavily researched programs have been done on soccer (futbol) players, and the two that I recommend the most are the FIFA 11+ and the PEP injury prevention program. Both programs follow the RAMP method for warm-up and both have been shown to reduce injuries. In fact, the FIFA 11+ warm-up has been found to reduce all injuries by 39%. In females the FIFA 11+ warm-up can help reduce anterior cruciate ligament (ACL) injuries by 50%! That is incredible, and really speaks to how a dynamic warm-up can have a positive impact on performance and injury reduction. In general some guidelines would be to start the warm-up routine before practices in the pre-season ideally for upwards of 9-10 weeks before the start of the season so that it has become routine and can be easily carried over into the season without lost time accommodating to the warm-up in season. Choose warm-up activities that can be modified to be easier or more complex depending upon your capacity and at what point you are in the season. Similar to most training procedures warm-ups can become routine and boring if they are not modified to help the athlete. Now, all of this may seem overly complex for a coach or individual to plan and carry-out. However, there are resources available, and you can always reach out to a skilled professional to help you arrange and implement a more dynamic warm-up. If you would like to get more information about how using a dynamic warm-up can help you or your team perform better while also reducing injuries please contact dallen@agadapt.com. If you have suffered an injury, and are in need of rehabilitation schedule an appointment or phone consultation. Thorborg, K., Krommes, K. K., Esteve, E., Clausen, M. B., Bartels, E. M., & Rathleff, M. S. (2017). Effect of specific exercise-based football injury prevention programmes on the overall injury rate in football: a systematic review and meta-analysis of the FIFA 11 and 11+ programmes. Br J Sports Med, bjsports-2016. Andersson, S. H., Bahr, R., Clarsen, B., & Myklebust, G. (2017). Preventing overuse shoulder injuries among throwing athletes: a cluster-randomised controlled trial in 660 elite handball players. Br J Sports Med, 51(14), 1073-1080. McHugh, M. P., & Cosgrave, C. H. (2010). To stretch or not to stretch: the role of stretching in injury prevention and performance. Scandinavian Journal of Medicine & Science in Sports, 20(2), 169-181. Cramer, J. T., Housh, T. J., Johnson, G. O., Miller, J. M., Coburn, J. W., & Beck, T. W. (2004). Acute effects of static stretching on peak torque in women. Journal of Strength and Conditioning Research, 18(2), 236-241. Gilchrist, J., Mandelbaum, B. R., Melancon, H., Ryan, G. W., Silvers, H. J., Griffin, L. Y., ... & Dvorak, J. (2008). A randomized controlled trial to prevent noncontact anterior cruciate ligament injury in female collegiate soccer players. The American Journal of Sports Medicine, 36(8), 1476-1483. Mandelbaum, B. R., Silvers, H. J., Watanabe, D. S., Knarr, J. F., Thomas, S. D., Griffin, L. Y., ... & Garrett Jr, W. (2005). Effectiveness of a neuromuscular and proprioceptive training program in preventing anterior cruciate ligament injuries in female athletes: 2-year follow-up. The American Journal of Sports Medicine, 33(7), 1003-1010. Nelson, R. T., & Bandy, W. D. (2004). Eccentric training and static stretching improve hamstring flexibility of high school males. Journal of Athletic Training, 39(3), 254. In my early 20’s, I lived in Argentina for 2 years. During that time it never occurred to me that I should be seeing a dentist on a regular basis. Growing up my mom would set up my regular dental exams, and I would show up to the dentist office every 6 months. However, after living in Argentina and then on my own through the early part of college, I had definitely fallen out of the habit of attending regular dental exams. I had 8 cavities filled over a 4 week period. Needless to say, I never missed another dental check-up! The practice of meeting with a trained expert is important in order to learn what we should be doing to keep our bodies in optimal condition! For the most part it has become common practice to see the dentist every 6 months, and to have a physical with a doctor every year. However, most people are not going to see their physical therapist for annual or semi-annual check-ups. It is often understated how important a physical therapist can be in finding deficiencies in movement, strength, cardiovascular capacity or range of motion that can become detrimental in the future. Physical therapists are experts in movement! That is what they are trained to be. Whether it be identifying compensations or overcoming current limitations, a physical therapist can play a valuable role in keeping you healthy and well. I love seeing people with any number of problems going on. It is really fun to diagnose their situation and get them on a path to meet their goals. However, I think about those times when the patient spent nights where they maybe only slept 1-2 hours or days when they missed work all because of their aches and pains in the shoulder. I think about how that situation would have been different had that person seen their physical therapist every year for a check-up. Maybe it is not something that the patient would go out of their way to seek care for initially, because it is not interfering too much in their life at the start. However, it could be something mentioned and evaluated in an annual check-up. Then that person could be helped to get on an exercise regimen that could help their shoulder or other condition before it evolves into something more complex. That is the value in checking in regularly with your physical therapist. As the saying goes “An ounce of prevention is worth a pound of cure.” When it comes to my teeth I know better than to skip out on my regular teeth cleaning and exam. When it comes to my physical health I know better than to miss out on a chance to be screened, and make sure that I am on the right track to a healthy life. In the state of Minnesota anyone can see a physical therapist directly without a physician referral. If you would like to schedule an annual check-up with a physical therapist, please click here. It’s 6:30 am, and the alarm goes off! You wake up a little groggy, but ready to start planning your busy day. You are lying in bed thinking about all of the things that need to be done and then, nature calls. You quickly throw off the sheets and step out of bed to an unwelcome shot of pain in the bottom of your foot. It’s that same unforgettable pain you experienced yesterday, and the day before that, and the day before that. Ugh! Pain in the bottom of your foot (near your heel), regularly referred to as plantar fasciitis, is extremely common. Approximately 2 million Americans suffer from plantar fasciitis each year. For runners, plantar fasciitis is the most common condition that is diagnosed around the foot, making up 8% of all running related injuries. Unfortunately, many people experience the painful symptoms and experiment with endless proposed treatment options. I have heard a fair amount of plantar fasciitis treatments. They range from rolling a frozen bottle of ice on the foot, running barefoot, and using odd-looking massage tools. Additionally, everyone has their special favorite stretch that gets passed around like a secret recipe for the best chocolate chip cookies. Sure, it is probably a good stretch or a good treatment option, but even the best chocolate chip cookie recipe doesn’t work for everyone. We all have different taste preferences, likewise, we all experience different forms of plantar fasciitis and different feet! There are so many different thoughts and recommendations available that it is important to follow the research. Fortunately, there are great research reviews that summarize the best treatment options for plantar fasciitis. I will split up the treatment options into 3 sections: Things you should try because research supports them, things you can do because some research supports them, and things you should do in more rare circumstances because research doesn’t really support them. Plantar Fascia Stretch: Seated with the painful foot and leg crossed over the other leg and then pulling up on the toes to feel a stretch along the bottom of the foot. This stretch should be done 3 times a day with ten holds of 10 second duration. Ideally the first round of stretching would be done before getting out of bed in the morning. Calf Stretching: Can be done in any number of styles. A traditional runners’ calf stretch, standing with the painful foot and leg behind the other and keeping the knee straight as you lean forward (towards the wall), can be an effective stretch. With this particular stretch, try placing a rolled-up towel under the toes which allows for more stretch of the plantar fascia. However, listen to your body because the stretch should be gentle to moderate, not severe. Calf stretching should be held for 60 seconds, for up to 5 repetitions a day. Taping: Certain taping styles have been found to be helpful for plantar fasciitis. For the most part the researched taping styles rely more on stability taping around the foot, and can include some antipronation strips. Low-dye taping is commonly used, though high-dye taping can also be effective. Taping is usually reserved for licensed professionals to perform, though anyone can be taught the techniques, and try to manage them on their own. In a general sense the taping is designed to help with the forces through the foot to relieve some pressure off the plantar fascia. Orthotics: Custom made foot orthotics can be beneficial for those that suffer from plantar fasciitis. However, treatment options can become very expensive when you seek an orthotic. Studies that have compared custom orthotics to over-the-counter orthotics found that both are helpful with no significant difference between the two besides the price point. When purchasing orthotics, I recommend you try them on before purchasing. It is important to get a good feel for what type of orthotic feels comfortable to you. Check out Super Feet insoles, which typically cost around $50 (available at most specialty shoe stores). Night Splints: If the plantar fasciitis symptoms have been lasting for more than 3-6 months, and you are having pain with the first step in the morning, then I highly recommend consistently wearing a night splint for 1–3 months. While many people have a hard time wearing night splints, they are helpful. Night splints can be purchased at most major retailers for $20–$50. The most popular night splint is a Strassburg sock because of its high comfort reviews. Anything you find should work, though you do want the pull to be from the front of your foot. Hands on Therapy: There is some research that shows that a professional helping with some ankle and foot joint mobility as well as some soft-tissue work in the calf and foot can reduce pain. Since the symptom reduction is usually temporary, this type of treatment option is usually an adjunct to other treatments. Dry Needling: The research for dry needling for plantar fasciitis is growing. As a whole dry needling research is still in the early phases. However, it appears that dry needling can be an effective addition to treatment for plantar fasciitis. Consider dry needling if your symptoms have not improved with other treatments. Shoe Wear: Despite the overwhelming amount of research and recommendations about shoe wear, it doesn’t seem to have much of an impact. First, the important thing to consider is comfort. The shoes you wear should feel good and not bother you. Beyond that, consider switching between at least 2 different pairs of shoes during the week, whether it be that you are running or standing. Having a shoe rotation can help reduce plantar fasciitis risk by upto 72%. Strengthen Up the Chain: Our bodies are not strictly divided into different parts. There is connection from the bottom up and from the top down. There is some rationale for strengthening the muscles around your hips, thighs, as well as the muscles of the back and the abdominal region. Ultrasound: Therapeutic ultrasound may have some value in other conditions, but is not effective as a primary treatment for plantar fasciitis. Steroid Injections: Getting a steroid injection into the plantar fascia has not demonstrated clinical benefit in 2 systematic reviews done on the subject. As you can see there are a lot of things that you should do, can do, and should only do in rare circumstances for the treatment of plantar fasciitis. It is not an all-inclusive list of treatment options. I have tried to include the list of things that have some evidence to back up claims being made. This does not mean that a frozen water bottle wouldn’t feel good on the bottom of your foot, only that there is no research to say that it is making a difference. So, keep doing your favorite treatments, and add some of the researched options into your rehabilitation and recovery. It is also helpful to work with a licensed professional to help you modify your activity to avoid further irritation to the plantar fascia, and to help you work through the recovery process. Physical therapists can be very helpful in diagnosing and treating plantar fasciitis. Martin, R. L., Davenport, T. E., Reischl, S. F., McPoil, T. G., Matheson, J. W., Wukich, D. K., ... & Davis, I. (2014). 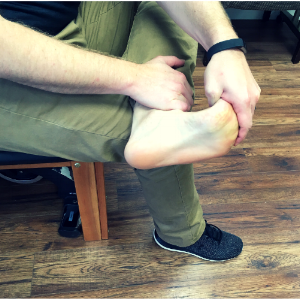 Heel pain—plantar fasciitis: revision 2014. Journal of Orthopaedic & Sports Physical Therapy, 44(11), A1-A33.